After one elimination, May 3 episode came out with top 9 of The Voice 2016 (season 10). It was a fierce competition among so many talented and potential future celebs. But, who do you think has recently left the show? 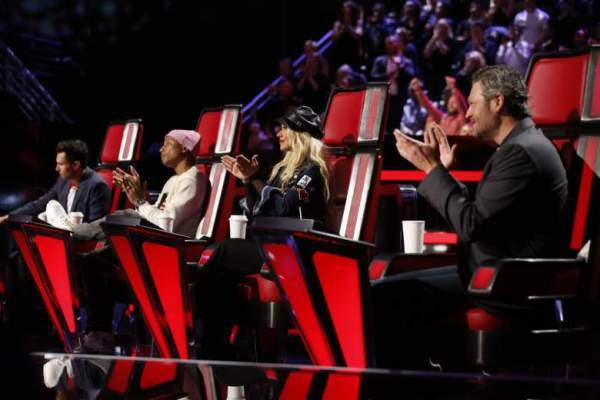 Was Christina Aguilera, Pharrell, Adam Levine, or Blake Shelton got eliminated? Scroll down and get to know. The night started with a guest performance by DNCE, who presented their all-new single track “Toothbrush” and a little bit of their first hit “Cake By The Ocean.” It was a high energy performance that described the quality of the night. After it, the coaches and contestants wished a happy mother’s day to their moms. Then, the time for the results came. Host Carson Daly announced Christina’s singer Alison Porter safe. It continued as the Adam Wakefield from Team Blake, and Team Adam’s Shalyah Fearing was declared safe. Only coach Pharrell was left with no artist from his team in the top 9 for The Voice 2016. However, it was a proud moment for Pharrell when a former contestant from his team and season 8 winner Sawyer Fredericks came for performance. He sang “Four Pockets.” And it was a lovely moment. Then, it was the time for results again. Carson revealed that names. Pharrell’s Hannah Huston proceeded with Blake’s Mary Sarah. A few more names were also announced. Daniel Passino from Team Pharrell and Nick Hagelin from Team Christina landed into the bottom 2. Now, they had to perform for America’s Instant Save vote. Nick came up with a stunning performance “Thanking Out Loud” by Ed Sheeran. Daniel performed on “Uptown Funk” by Bruno Mars. The audience cheered up for both of them. However, it was the time for final voting via Twitter. After a break, Carson revealed that Nick will move on while Daniel will go home. Below is the list of top 9 contestants of The Voice season 10. Blake and Christina are giving the tough competition to other teams as their all three participants have reached the top 9. Pharrell has only one left while Adam has two. We will see one more candidate going home next week. Who is your favorite contestant now? Share your views and thoughts with all via commenting below.